SINGAPORE -- For Chinese art specialists, the Qingzhou Buddhist sculptures, discovered by chance in 1996, are one of the most significant archaeological finds of the late 20th century. In an exceptional state of preservation, retaining some of their original paint and gilding, the sixth-century sculptures also bear testament to the inter-connectedness of ancient Asian cultures, showing stylistic experimentations with clear influences from India. 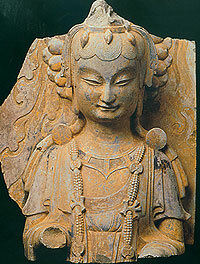 Among the sculptures discovered in Qingzhou, China, are a bodhisattva of the Eastern Wei period. "Serenity in Stone: The Qingzhou Discovery," an exhibition of 35 sculptures now at the Peranakan Museum in Singapore, highlights the rapid stylistic change in representing the Buddha that took place over a 50-year period when the Northern Wei dynasty (386-534) disintegrated and gave rise to the Eastern Wei dynasty (534-550) and Northern Qi dynasty (550-577). Scholars estimate that about 90 percent of the stone sculptures uncovered on the former site of the Longxing Temple in Qingzhou, China, were carved between 529 and 577. The Northern Wei rulers were strong supporters of Buddhism, although the original Buddhist teachings from India had been combined with Chinese culture and beliefs (notably Taoism and Confucianism). Buddhist art flourished and developed distinctly Chinese characteristics, most evident in the Chinese-like facial features and the figures' garments, which were similar to the robes of Chinese scholars with a rhythmic design of the folds. In China's Shandong Province small Buddhist bronze altarpieces had given way to stone stele carvings by the early sixth century, said Liu Yang, curator of Chinese art at the Art Gallery of New South Wales, which co-organized the exhibition with the Asian Civilisations Museum in Singapore. But while innovative patterns on steles could be found elsewhere, in Shandong, three figures - a central Buddha flanked by bodhisattvas (a being who has delayed enlightenment to help others) on either side - remained the primary model for representation. Liu added that new iconographic elements, such as a pair of writhing dragons sprouting lotus flowers from their mouths which formed part of the pedestal for the Buddhist sculptures, were introduced to steles during the late Northern Wei period. In "Stele with Maitreya and two bodhisattvas," dated 529, two smiling figures were carved at the upper corners of the stele, each holding a disc. According to Chinese scholars, these discs represent the sun and the moon, a reference to Taoism, said Tan Huism, deputy director at the Asian Civilisations Museum. "What is amazing with this exhibition is that you can see how the style of representation changed within a very short period," she said. "In the late Northern Wei period, the Buddha has a very formal and stiff posture with a flattened body. You have no sense of the body beneath the robe. But in the Northern Qi style, you can see the contours of the body under thin robes. The style becomes much more naturalistic." Scholars believe the changes reflect influences from the Gupta style of art from Sarnath (where Shakyamuni, the historical Buddha, first taught) and Mathura, a northern Indian center of artistic production during the period, she added. During the Northern Qi period, bodies became bulkier with broader shoulders and a new garment style emerged, unlined in the torso and pleated only around the edge of the mantel. Some robes, inspired by the artistic style from Mathura, have folds arranged like ripples across the body, moving away from the Chinese scholar robe though, unlike the Indian model, they are often arranged symmetrically. "There is a real attempt to indicate the body beneath the clothing. Some sculptures are fine examples of the 'Caoyi chushui' style or the wet T-shirt effect, as the garment really clings to the body," Tan said. The expression "Caoyi chushui" comes from the style of drapery developed by a Northern Qi court painter, Cao Zhongda. There were still significant differences between the Indian and Chinese styles. For example, the Buddha's high ushinisha (the bump on the head representing wisdom) found on early sculptures of the Gupta style became much flatter during the Northern Qi period. The carving of bodhisattvas also became more elaborate especially during the Northern Qi dynasty, with rich ornamentation, like golden necklaces and long chains. Bodhisattva are often depicted as beauties of ambiguous gender, which is in keeping with the belief that they are able to assume any gender or form to help others on their path to nirvana, and also because the Chinese consider compassion to be a feminine trait. "From an art history point of view, it's a very important exhibition," said Kenson Kwok, director of the Asian Civilisations Museum. "The sculptures are truly exquisitely beautiful and they are in an exceptional state of preservation. In some pieces you can see painting and gilding, in some cases you can even see painting over the gilding, which is even rarer because the pigment doesn't really adhere to gold leaf very well." He added: "Art historians will know that ancient Greek and Roman sculptures were also painted, and as we all know there are very few of those left with any color. Here, you can see how the maker of the statues intended them to look." The 400 sculptures and fragments were discovered 1.5 meters, or about 5 feet, below ground level in a pit measuring 8.7 meters by 6.8 meters and 2 meters deep. Thanks to coins found among them, as well as 12th-century pottery, scholars agree that the sculptures, mostly carved from a fine-grained, pale gray limestone, were given a sacred burial in the 12th century. Because of the variety in their facial expressions and stylistic representations, they believe they came from different temples around Shandong Province, where Qingzhou is located. Why they were buried remains a mystery and a subject of scholarly debate. "One commonly accepted theory is that the Qingzhou sculptures were buried during a period of strong anti-Buddhist sentiment. Fearing the growing influence of Buddhism was a threat to its own power, the government ordered the mass destruction of numerous temples and Buddhist sculptures," said Xie Zhixiu, director of the Shandong Provincial Cultural Bureau and deputy director of the Shandong Provincial Department of Culture, through a translator. "However, this is not to say that the Qingzhou sculptures were destroyed by anti-Buddhist forces," Xie added. "Instead, their careful ritual arrangement in the excavated pits suggests that the sculptures could have been buried by devotees to protect the precious artifacts. The way in which certain figures were found also suggests that they may have been buried intact, with breakage only occurring due to stress over time. Also, the sculptures may have been buried in a hurry, due to the urgency of the task."